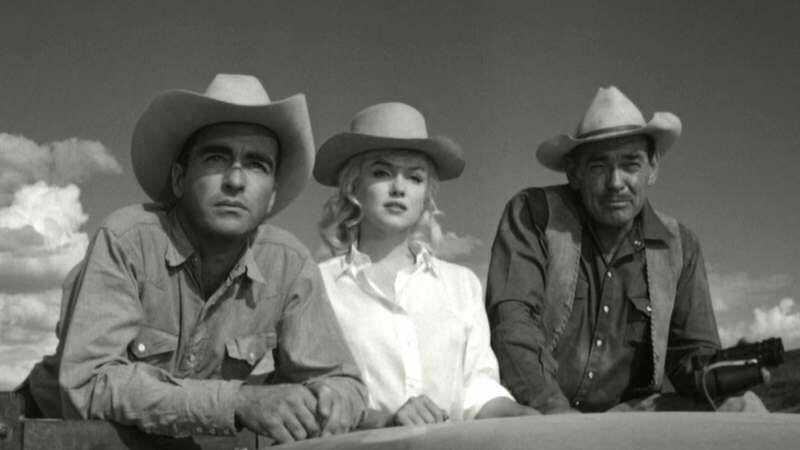 Movies are a death-tinged medium, but few films are as uniquely haunted as The Misfits, in which the Nevada desert is transformed into an elephant graveyard of classic Hollywood stars. None of its three above-the-title players lived more than five years after its release; Clark Gable suffered a heart attack right after the famously troubled production finally wrapped (over budget and past schedule) while Montgomery Clift gradually receded from acting in the aftermath. But the ghost with the most at stake to critics and scholars is Marilyn Monroe, whose performance as a would-be cowgirl who discovers she doesn’t have the stomach for the lifestyle was her last—and maybe her greatest, even if she claimed to hate it at the premiere. Introduced sidling up to aging horse wrangler Gay (Gable) in a crowded bar, Monroe’s Roslyn is an icon of warm, earthy desire; she wraps herself lovingly around a tree in the woods and chides her lover for trying to shoot a rabbit in the garden. Roslyn’s empathetic naiveté—her compassion for all of God’s creatures, including even Eli Wallach—makes her an outlier in a film whose male characters are all hardened to the harshness of the world. It also evokes behind-the-scenes legends about the actress, whose struggles with insomnia and drug addiction derived from extreme emotional sensitivity. The film was written by her husband, Arthur Miller, who 40 years later penned a play called Finishing The Picture based on his experiences on set. With this in mind, Miller’s script is fascinatingly ambivalent toward Roslyn; it’s a rich part with cruel contours. Gentlemen Prefer Blondes and Some Like It Hot celebrated Monroe’s otherworldly softness and sexuality (which she was also brilliant at playing for self-reflexive comedy). The Misfits frames them as a liability—she accidentally seduces every man around her, a blameless siren who responds to her suitors with disappointment. Roslyn is so out of her element that she seems like a tragic heroine, even if the story ultimately contrives her a happy ending. Watching Gay and Roslyn drive off together at the conclusion is bittersweet because we know how little road the actors had in front of them. Monroe died 18 months later at the age of 36. Availability: The Misfits is available on Blu-ray or DVD from Amazon or possibly your local video store/library. The film can also be rented or purchased from the major digital services.